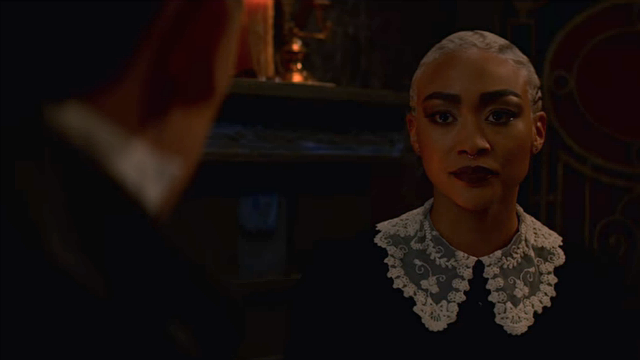 In the previous episode of Netflix’s Chilling Adventures of Sabrina, Sabrina learned too late that she had been performing miracles to fulfill a prophecy about the apocalypse. 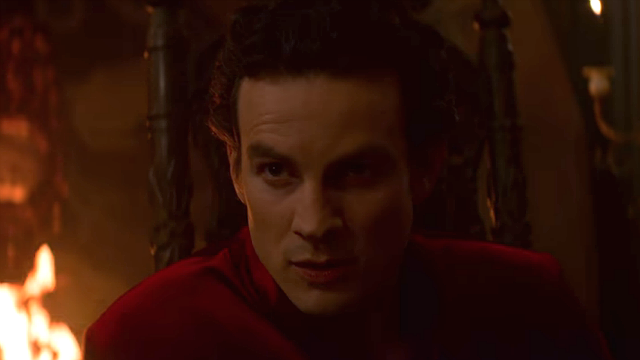 In the Season 2 finale of Chilling Adventures of Sabrina, Satan revealed the truth about Sabrina. Satan returned in his angelic form, minus the wings. He finally revealed what made Sabrina so special. Edward Spellman was not her real father. Edward and Diana had trouble conceiving a child so they went to Satan for help. Satan was Sabrina’s father. What’s more, Nick had gotten close to Sabrina because Lucifer told him to. Nick insisted that the love he felt for her was real, but Sabrina spat at him in disgust. 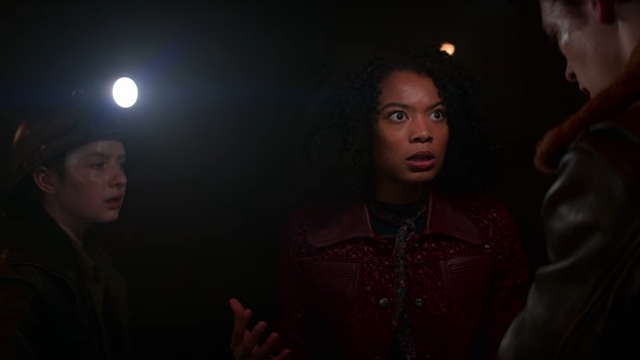 Lilith wanted the crown and throne for herself, so she went to the Spellmans’ to help them defeat Lucifer. Sabrina needed to flatter him as a distraction, and they used a horseshoe to contain him. Ambrose presented a distraction while Hilda and Zelda stabbed the wounds on his back with daggers forged in the city where Christianity began. Unfortunately, the plan didn’t work, and Satan threatened the aunts’ lives, forcing Sabrina to blow Gabriel’s horn. When Sabrina blew the horn, Roz, Theo, and Harvey were at the Hell gates in the mine. Roz’s cunning allowed her to see the symbols that could lock the gates. She was able to share her cunning vision with Harvey, who furiously drew the symbols. They scattered the drawings all over the ground in front of the gate, and some quick thinking from Theo sealed the gates when it was just ajar. Lilith found them, expecting to find a group of demons to take to the ceremony instead. Blackwood lied to the coven and told them Satan approved of the Church of Judas. He had the entire coven participate in Unholy Communion and then rushed to pack his bags. He, Prudence, Judas, and Judith would leave Greendale. Blackwood had poisoned the Unholy Communion and was going to leave them for dead. Prudence refused to leave with him and brought her dying sisters to the Spellmans’. At the end of the episode, Ambrose and Prudence left Greendale to find and kill Faustus. At the ceremony, Sabrina wore the crown, sang, and danced the Mephisto Waltz. The demons that surrounded them started an incantation, but they weren’t demons at all. They were trying to bind Satan and trap him in a spiked ball. Unfortunately, it couldn’t contain him, so Nick drew Satan into himself. They were able to trap him in Nick’s body. Lilith put on the crown and gave Sabrina back her powers. She took Nick and Lucifer with her into hell but gave Sabrina the real Ms. Wardwell back. Sabrina and her friends decided to form a “Fright Club”, and Sabrina’s first mission for them was to bring Nick back from Hell. 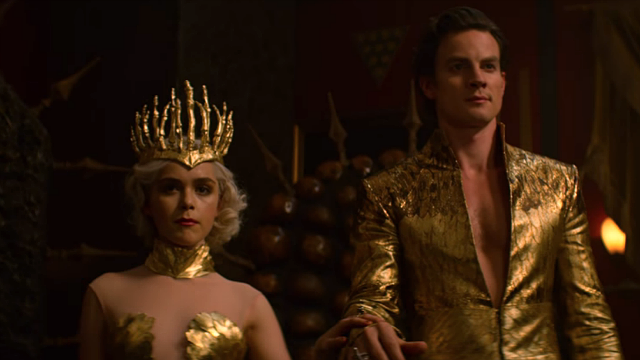 What did you think of the season finale of Chilling Adventures of Sabrina? Let us know in the comment section below!